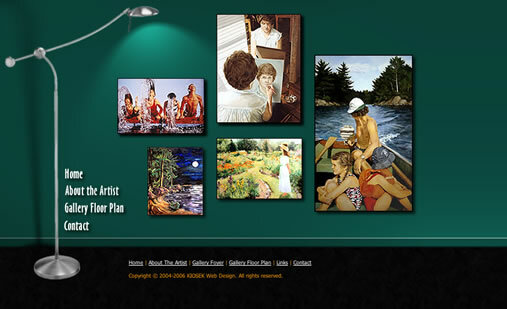 KIOSEK is a small design studio based in usually lovely (but often chilly) North Bay, Ontario, Canada. We develop custom websites, of course, but we also do graphic design, logo design, and desktop publishing of professional print-ready posters, book covers, magazine covers, brochures, and business cards. We also love working with artists and writers, so it should be said that we specialise in online galleries and virtual bookstores, even integrating PayPal as our way of dispelling the myth of the starving artist. Large or small, we can build it and then we'll host it too. For web or for print, we have years of experience with Adobe Photoshop, Illustrator and InDesign. We have the tools to help you tweak your business identity with custom logos or typography. Our team includes university graduates who are also published writers. We can proofread and edit your text helping to translate your ideas into compelling copy. Be it magazine covers, book covers, posters, brochures or business cards, we can prepare professional print-ready files, and even take care of the printing for you. Using the latest HTML5 and CSS3 techniques we strive for responsive websites that are functional, yet elegant (even if PHP & MySQL are hiding backstage). Be it Apple or Android, more and more people are accessing the web with the latest tablet, phablet, or smartphone. Surely you want to look your best on mobile? Whether it's WordPress, Joomla or another of your choosing, we can install a blogging platform on your domain and show you how to use it to update your own content. Calling all artists: Showcase your artwork or photography using online galleries that look just as good on your smartphone as they do on your PC. The internet is a godsend to anyone offering a niche product to a niche market. We design custom storefronts with a shopping cart system and a database backend. What good is an online store if you can't conveniently accept payment? Not much. We'll help you connect PayPal to your store so that you can receive online payments via credit card. We charge $50 per hour for design. Consultation is free. Once the scope of the project has been agreed upon, we will we offer an estimate of the number of hours it will take to complete. If the estimate is acceptable, the client will pay five hours upfront, and the remaining amount only when the client is 100% satisfied with the result. "Establishing a permanant, reliable presence on the web." Even if you are using social media such as Facebook or Twitter, if you're a professional (or even if you're not), having your own domain name and website online that you and others can link to will set you apart from the crowd. We can purchase the domain name for you and setup an email account based on it (example: "yourname@yourdomain.com"), and provided you can supply the content (relevant text and/or photos) we can design a menu structure and overall look of your site in 3-5 hours, and then at a rate of one hour per page we can create the desired sub-pages. "Artist or photographer wants to display their work online." Maybe you already have a domain, and you have a body of work that deserves an elegant online showcase. No matter the number of images you have, if you can supply them, we can design and install a gallery that will look just as good on mobile devices, such as Apple's iPad, or an Android smartphone, as it will on your desktop computer at home. "Writer or publisher wants to create an online bookstore." We can create a virtual storefront for your business using shopping cart technology and connect it to PayPal so that people can purchase your products online right from your website. Initial graphic and database design is a 10-15 hour job. The time it takes to add items to the store and the database backend will depend on the number of items, perhaps another 3-5 hours. No domain name, no website! If you don't already have one, we can register all the usual suspects, such as: .COM, .NET, .ORG, .CA, or even .BIZ, .INFO, .MOBI, .ME, .CO, .TV. We also offer many others that will be rolling out later this year, among them: .CLUB, .BIKE, .ZONE, .LAND, .GALLERY. 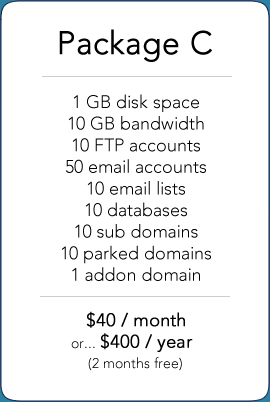 Standard domain names (.COM, .NET, .ORG & .CA) are now free with any of our hosting packages when paid annually. 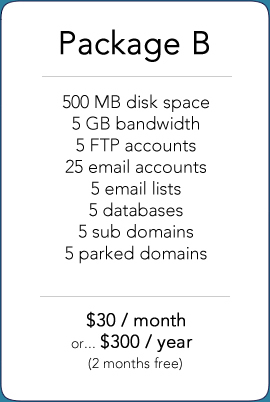 See below for our hosting package pricing. We pride ourself on our "uptime", so if you experience any "downtime" at all due to server issues at our end, we'll tack on a free month's hosting to your account. We realise that your personal documents are important, even critical if you're running a business online. That's why everything on your server is backed up every day. Welcome to my laboratory, where safety is the number one priority! Every account is covered by server-wide firewall and antivirus protection. We make sure that code running on our servers, such as Apache, PHP and MySQL are up to date so that you don't have to. All hosting packages include access to a password protected "Control Panel" which allows you to control all aspects of your site, including email accounts, databases, and more. Suitable for most personal or small business sites. Ideal for any size business or high traffic website. If this, our premium package, isn't enough, just contact us. This dog is not a client, but she is definitely a project! 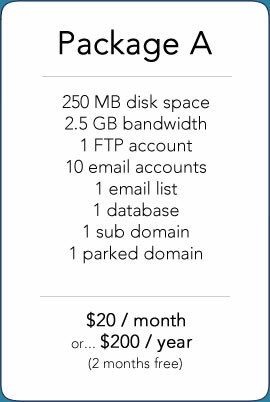 It's summer time in North Bay, and I really should be out on a bike ride, but it was time for an update to our hosting packages and a more modern look that plays well with mobile. Smartphones and tablets will soon outsell PCs, so this will become increasingly important to anyone with a web presence. With that in mind, if you get a chance, please check us out on your iPad or your Android device and let us know what you think. In the coming weeks, we'll be filling out this section with content regarding past clients and projects, but for now please just swipe (or click and drag) to check out a couple of things we're currently working on (yes, indoors) instead of battling the bugs down at the lake! Judith Ingwersen is a local artist whose site we initially designed from scratch nearly a decade ago and are now in the process of making mobile-friendly. As a visual artist, an online gallery key, and increasingly, being able to view this kind of content conveniently on a smartphone or tablet when you're out and about is critical. We're familiar with her fantastic work after all these years, but we're working hard to make it look as good as it possibly can regardless of the device. The new mobile-friendly version of Judith's gallery will be launched very soon, but the original version, hosted on our servers, is right here. Two Cultures Press is an independant local publisher for whom we created an online bookstore in 2008. They came to us with their own design ideas, we built a shopping cart system using a MySQL database back-end, and then connected it to PayPal so that customers could make purchases online seamlessly by credit card. We also host the site, and we've been maintaining it ever since. In fact, their newest book, "Explaining Canada: A Primer For Yanks" by Ken Stange, has just been released, and we'll be adding that to the store very shortly. You can visit Two Cultures Press here. Thanks for your interest. We'll be in touch. All contents Copyright © 1998-2015 Christiaan Stange. All rights reserved.